Continuing on for my current love of Korean food I recently went to one of the more casual offerings Best Friend on Pitt St. It has all the tell tale signs of a good city Asian eatery; it's humming with young couples and groups of friends and the crowd is primarily made up of the ethnicity of the restaurant. Any Korean eatery where the primary menus and signage are in Korean is always a good sign. We're by no means the only anglo people in the room but I can't help wondering how many of the boys here were introduced to the food by their girlfriends. Like many similar city restaurants there's a large screen pumping out variety shows and Kpop videos in the background, this is always a love hate relationship for a diner. Kpop has all the glitz and choreagraphed dancing of similar Japanese Pop offerings but with a slightly more 80s feel and often a lot more humour. While we're eating a clip shows where the protagonist sings a heartfelt love song while wearing a chicken suit, sadly I failed to get a decent photo of it. The dinner is more casual than many Korean restaurants and I gather a bit cheaper so the Banchan are hardly fancy but still welcome. A small salad, kimchi, fish cake and rice jelly are brought out with our drinks. When boiled these mandu dumplings are more akin to wanton than gyoza but they remain one of my favourite relatively guilt free starters. Minced pork, shallot and glass noodles are wrapped in a wheat based dumpling skin. The soy/chilli/sesame sauce served with these is filled with umame and one of the better examples of dumpling sauce I've tried. Best friend has a number of bento style casual meals available at a reasonable price. This comes with a spicy pork bulgogi, rice, salad and miso soup for $13 making it a great place for a quick reasonably priced bite on the way home. It's not ground breaking food but for a quick pre-cinema meal or post drink dinner it's not a bad option. This dish is my current obsession, I could eat it day in and day out and the version at Best Friend is a great rendition. Soft sausage shaped rice cakes are reminiscent of rice based gnocchi, they're soft with a pleasantly chewy texture. This is then cooked in a gochujang chilli sauce not for the feint hearted - if you don't like spicy food stay away from anything Korean and spicy, they like it super hot one of the reasons I love their food! This version has a bit of texture too it so I suspect they have used tomato in their sauce, it is also laced with chunky vegetables and slices of fish cake. Being lactose intolerant I can do without the cheese but it does go well with the sweet spicey sauce. Be warned this meal is huge, it's designed for 2 people - or me and my lunch tomorrow! If you are going to heat it up make sure to use a wok or oven with a little extra water as the rice cakes lose moisture over night and can be chewy. Definitely avoid microwaving. This and Darling City are easily two of my favourite casual Korean diners, great for a quick bite at a reasonable price but nothing fancy. Great for when you're sick of Thai food in Sydney. For those out for a rowdy evening $9 bottles of soju and meat dishes bound to soak up the drinks are a great pull as well. It was recently my 30th birthday and as a treat my boy took me out to Glass at the Hilton. Glass is the latest venture by celebrity chef and restauranteur Luke Mangan. The decor is modern and chic, well thought out and subdued, just as you would expect from a top tier restaurant in a leading 5 star hotel. Most importantly for a restaurant such as this the sound engineering is such that you can't hear the conversation at the next table. The high ceilings and glass wall lend a huge air of spaciousness and it is all helped along by views of the beautiful Queen Victoria's Building across the road. Sadly it was under renovation at the time of our dinner and I couldn't get a photo that would do it justice. We are presented with the menus and here is the only criticism I will make of the evening; the food menu was on a large clipboard and when I say large I mean A3 in size, far larger than my actual table setting so I could not set it down at any point. This made it rather awkward to hold and review and eventually I gave up and balanced it over my forks. The wine menu was also ridiculously large but not in dimensions - just in content! The menu is the size of a slim novel (a full 45 pages) and takes in every major wine producing country and most wine regions of the antipodes. I deliberate for some time and argue with myself about choices until the waitress wonders if I might like to speak to the sommelier, however her question only prompts me to make a decision. Those who know me well know I like Champagne, and I can't walk past a Billecart, especially as a toasting glass in a celebration meal. Being a traditional Champagne it's a blend of Pinot Noir, Muenier and Chardonnay with a citrussy front and a clean finish, just perfect with lighter summer appetisers. We ponder the food menu once again and decide that the tasting menu isn't for us - the boy doesn't eat liver and much of the menu is seafood that we are not fond of so we order a la carte more to our tastes. Fresh breads are brought to us and served simply with Mangan's signature olive oil which has a fresh grassy taste, lighter than the Spanish oils I usually use but fresh and well blended. It's my 30th birhday, I'm feeling poorly, the only thing I want in the world at this moment is a liver parfait. I brightly smile at the menu and my dining companion knows exactly what is coming. This liver parfait isn't my favourite in Sydney (that probably still goes to Danks St Depot for the texture and the parmesan) but it is good and served with a pear chutney and toasted brioche. This makes for a happy goth gourmande. Continuing the birthday wishlist the menu provides once again with this raw tuna dish, served with a bright fresh yuzu sauce and lotus root chips as if the chef had asked for my favourite foods before I arrived. The meat is light and fresh, not as meaty as some tuna I've eaten but immaculate quality and the flavours mesh perfectly together - a definite must order. Three entrees is probably too much but again it's my birthday and another all time favourite has to be charcuterie. This plate doesn't disappoint either; marbled beef carpaccio, prosciutto and pork salami are served with crisp pickles. We are brought more of the sour dough bread to eat it with and the acid of the pickles cuts perfectly through the fat of the meats. I love a Grenache Mourvedre with aged beef and after much arguing with myself over the wine menu I chose this Torbreck, sadly the 2006 listed wasn't available but they did have this 2007 which honestly was more than ready for drinking. Torbreck has really made a name for itself as a fantastic Barossa winery and this bottle is no different. The sommelier approaches apologises for the change in vintage, we do the taste and approve dance and then he decants it beautifully using an aerator. Originally this meal was served with parmesan and truffle fries however I'm not so much one for chips and so changed this order to a truffle mash instead. This may have been my downfall, between the 3 appetizers and the richness of this meal I couldn't eat it all and rather wish I'd ordered it with a salad. Nonetheless the meat was beautifully cooked, dripping in melted Cafe de Paris butter and the truffle mash was rich and flavourful. Definitely worth ordering, think about skipping the entree if you really want to fit it in. I was too full to try all but the smallest amount of my companion's meal but it was beautiful, the pork sausage particularly was spiced well and set off the wagyu. I've never tried the Rangers Valley beef prior to this meal and I must say I was impressed. The chef too knew how to handle the steak, all too often kitchens will leave high marble steak to cool too long while resting and the fat becomes gelatinous; not so here. I think we were a little optimistic about how much we could eat, but it's summer and I like a salad with my meal. This was probably the only lowlight of the meal, it wasn't very exciting and could have been dressed more. No matter how stuffed we were though a celebration meal deserves sweets. Here you can see the chamomile tea that I needed for the illness. One of the best things about creme brulee has to be cracking the sugar on top so this large flat bowl of brulee was just perfect and filled with extended sugar related glee. The smooth vanilla bean custard underneath was just icing on the cake really. Figuring myself to be too full and ill for a whole dessert I ordered petits fours and then was served with an entire platter of the things, so much so that I took most of them home. Mini truffles, quince jam, pistachio nougat, home made marshmallow, mini Cannelles Bourdalaises and mini Madeleines served two by two so you and your companion can share the tastes. Each mini mouthful was wonderful and there was a temptation for every palette. As someone who loves a small bite of many things this was a real delight. The comment I must make which is sadly not always true was that the service was immaculate. On arrival we are seated and tended to, I point out to the waitress that I am not well and I would like her to bring more water than normal, she courteously refills my glass with my preferred water time and time again without requiring prompting. Eventually when I have drunk significant imported water she makes sure that I still want bottled rather than free water in a very polite manner. Additionally due to being ill I had drunk little of the bottle of wine we had ordered, at the end of the meal they looked sympathetically at me and not only offered to let us take the rest of the bottle but also decanted it back into the bottle and gave us a signature carry bag to take it home in. At no time was I left without my needs attended to but I never felt like the waiters were hovering or imposing; the perfect balance of front of house service to be duly commended. Some high quality restaurants you go to just to try, others become emotional favourites and this was definitely in the latter category. I am often dubious about celebrity chefs but I can't help but feel that Mangan has earnt his reputation; the menu, food quality, service and decor are on top all the way. I can only recommend Glass for the next time you have a special date or reason to celebrate. Sydney has differing Asian communities to where I grew up which leads to some interesting cuisines that I don't have much experience with but I have come to know and love Korean food. Doorae is one of the many ssam Korean BBQ restaurants in Sydney and is conveniently close to the Red Oak beef cafe on Clarence St, making it perfect after a few drinks. That being said Korean BBQ is perfect drinking food anyway, plenty of pickled nibbles, meat, salad and fruit wines! Plum wine is a definite weakness of mine, the Korean version is lighter and dryer than the Japanese umeshu making it perfect in Summer or in the heat of the table BBQ. This Seoljungmae brand has become the default version sold at most restaurants in Sydney, sadly they do not have the "gold" version which comes filled with green picked plums. Soju is too tart for my tastes, it's like a rougher stronger version of the Japanese shochu, like drinking cheap grain vodka. Nonetheless my friends drink it merrily by the glassful. Thankfully Korean standard is to also serve a large bottle of cold water with all meals as the short sharp shots of alcohol are deadly without it. Dumplings are one of my all time favourite foods and these fried snacks don't disappoint. They're fried in light oil with a thicker pastry than Chinese jiao zhi, filled with minced meat and glass noodles they're the perfect drinking snack. 'Jeon' just means fried things and this one is a fried Korean pancake similar to a chong you bing (scallion pancake) in Chinese cuisine, however pancakes are usually more heavily laiden with fillings in Korean cooking. This one is mixed with kim chi to give it a vinegared chilli taste that brightens the pancake to a bright orange colour. The taste is excellent but I admit that I'm used to Korean restaurants serving much larger and more perfectly rounded jeons than this version. Most ssam restaurants will bring small dishes (banchan) to accompany the meat included in the price of the meal, some of the better ones in Sydney will also refill these endlessly. Here pictured is Miyeok muchim - dressed seaweed, Musaengchae - raw white radish cut into stripes, Baechu kimchi - Pickled and spiced cabbage leaves and Gamja namul - glazed sweet soy simmered potatoes. As this is a BBQ restaurant we order fresh meat which is then grilled on a coal fueled hot plate set into the table. I like to grill it a little at a time as we talk and drink however some restaurants don't like patrons to do their own BBQing and the serious looking woman who comes to turn our meet confirms that this is indeed a restaurant such as this. I absolutely love beef cooked in the Korean style, and the kalbe marinated short rib is a must at any Korean BBQ. The lean meat from across the flank is left attached to the rib and can be rolled out like a carpet on the grill rather than smaller strips of meet left along the rib as with American style BBQ. Of course a good quality fillet steak is thrown in for good measure. Pork belly also done on the BBQ is marvelous in these thin fatty strips which caramelize in the intense heat to give a sweet and salty taste despite the relatively quick cooking time. The meat is eaten laden with ssam sauce - a thick umami heavy paste made from fermented miso beans wrapped in fresh lettuce leaves which are welcome in the heat. It's rich and heavy food however and I am soon full. Sadly Doorae does not have any sweets on the menu and I am not in the mood for the cold buckwheat noodles that traditionally finish such a meal so instead I settle on more fruit wine. I've never tried this Blackberry wine before but I shall be having it again. Ice cold after the hot meal it's a great finish to the evening, sweet without being overpowering. The service at Doorae is much like many similar Korean restaurants - efficient rather than friendly, though they gently attempt to tell us when we are attempting to order too much alcohol at once without being rude so I think this is merely cultural difference rather than any kind of rudeness. I prefer not to eat at any ethnic restaurant not filled with people of that ethnicity and Doorae is no different, it seems mostly to be filled with Korean families having celebration meals. The environment is nice, if not lively, and I would say that Doorae is a comfortable but not excellent example of the cuisine. If you're in the vicinity or can't handle the loud erraticness of Shinara or BBQ City this is definitely an option but I wouldn't go out of my way to come here. Family atmosphere - no carousing students or Korean pop videos to be seen. A service that I love in Sydney is Menulog who will collect and deliver restaurant food from restaurants in their network that do not have delivery drivers. At only $3 on top of your order this is cheaper than many restaurants used to charge for delivery using their own staff. Perfect for when you're craving food that's not standard delivery food, are too sick to leave the house for soup or for those times when you want to order online with a credit card and avoid talking to humans (high praise from many nerds). On top of the price and convenience Menulog will also SMS you when the restaurant receives the order and when their staff collect the food for piece of mind. 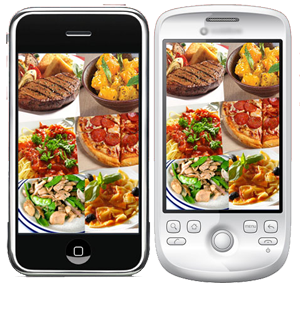 Menulog now have applications for smart phones making it super easy to order Chinese from the couch! The app is available for both iPhone and Android and is free, if you don't own a smartphone there's a mobile browser link that works as well. I decided it was high time for a clean up of my digital life and so as part of that process I have moved this blog from Livejournal to Blogger and registered the new domain www.gothgourmande.com so please update your links. Additionally I would like to make a little apology that I am putting ads on this layout so that I can learn the AdSense product - I apologise for the disruption in layout as this is a training and not a monetization process please let me know if you find any of the ads disruptive or the content innappropriate, I will be trying to ensure relevant material appears on my site.